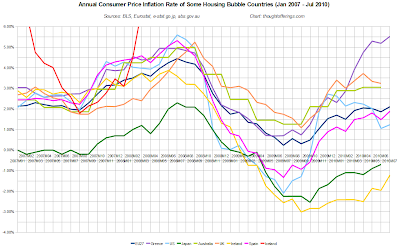 While the US deflation risks seem to dominate discussion on the blogs I follow, there has been ongoing talk of the international deflation risks, especially for other housing bubble countries. 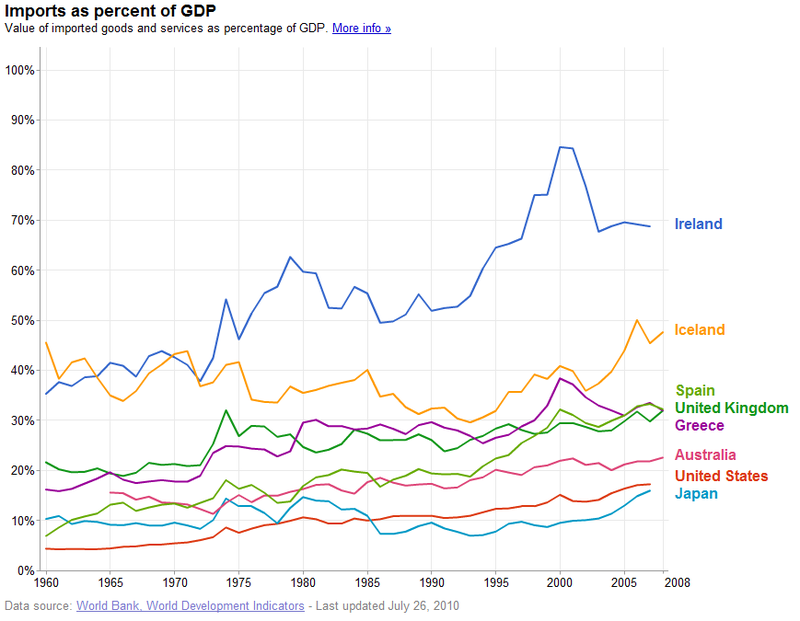 The talk intensified in late 2009 as Ireland and Japan both experienced intensifying deflation. Discussion again picked up in spring to early summer of this year in the context of the anticipated deflationary pressures that austerity measures would bring to countries within the European Union. 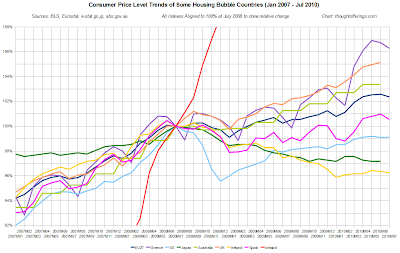 Here's a long due update on price levels graphs for various housing bubble countries (the US, Australia, UK, Ireland, and Spain). 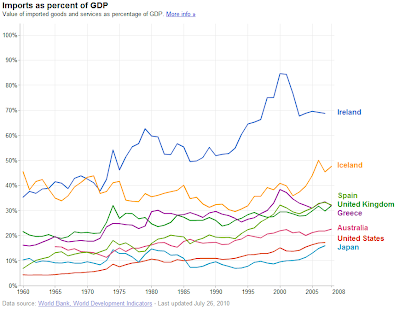 Out of interest, I also include Japan, Iceland, Greece, and the EU27 area, as each has played a prominent part in crisis headlines over the last couple years. 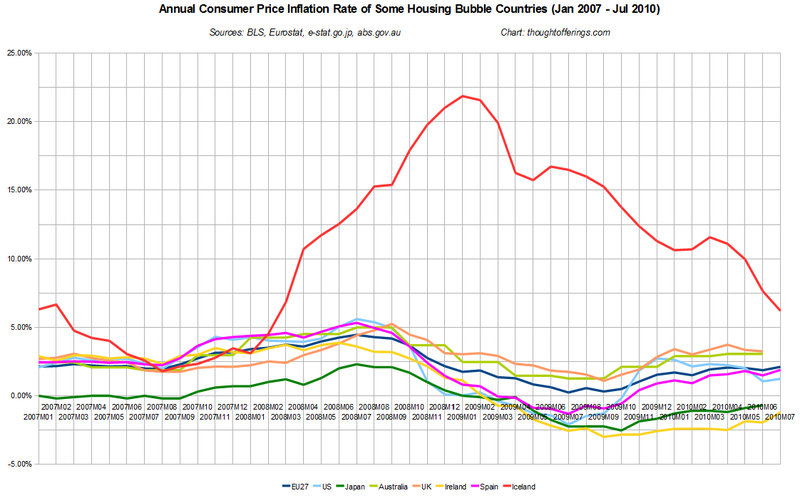 Price levels in Japan and Ireland appear to have bottomed out around January of this year. The US suffered the biggest decline in 2008 and has yet to reach its previous price level peak. 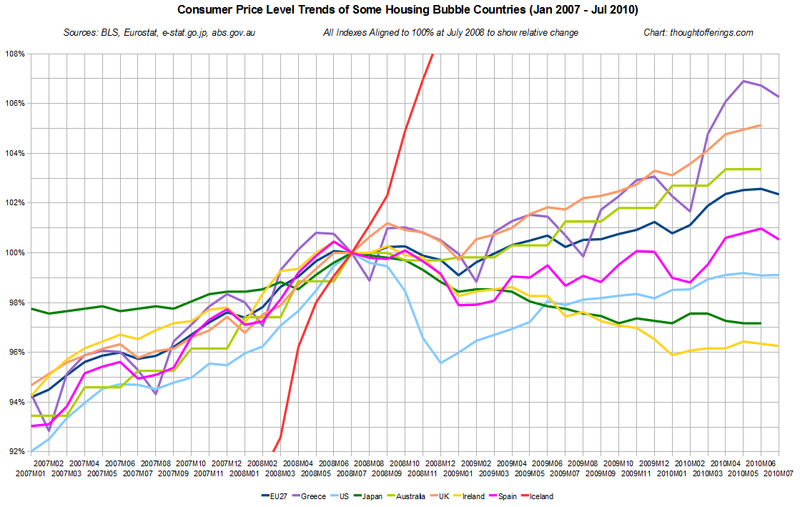 The remaining countries have continued an upward price level trend, each to a different degree. Inflation in the UK and Australia currently seems to be flattening out in the 3% range. Inflation in Greece has kept rising and is over 5%. Inflation in the US is falling. Inflation in Spain and the EU27 region is around 2%, with the trend unclear. Japan and Ireland both have a moderating level of deflation, moving toward flat line (this is more visible in the prior price level graph). 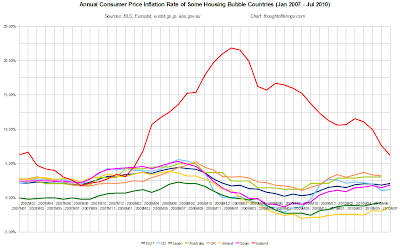 Will any countries within the EU experience a deflationary spiral as some commentators warn? It seems unlikely. Will they experience falling inflation and eventual possible mild deflation, following the Japan (and perhaps US) path? Maybe in some cases, but absent acute crisis conditions (a possibility), these price trend changes seem to take years to unfold. In addition, actual house prices don't seem to have corrected nearly as much in other countries as in the US (measured relative to incomes and rents). 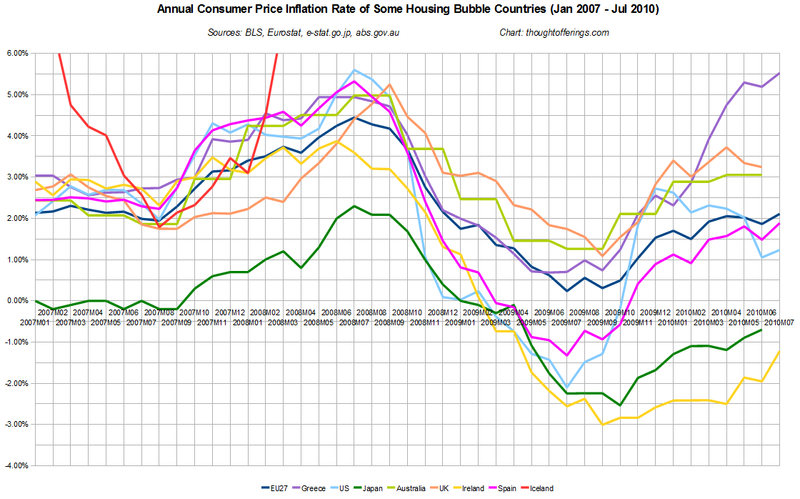 In the US house prices peaked around five years ago and while we have continued disinflation we don't yet have sustained deflation.